Believe it or not, between the last post and this one, I have spent all my “car time” getting the Morgan scuttle to fit a bit better (again) and then filling it so it wasn’t a complete disaster. 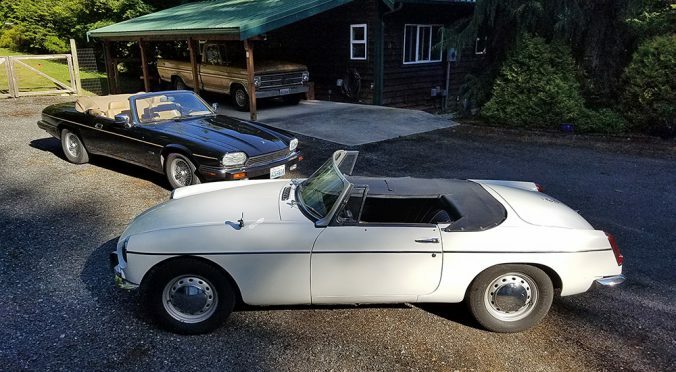 A bit more about that inside, but here’s Reg the faithful MGB, and the XJS which was going to be a “quick sale” (and which I need to sell but have not found the time), and Goldie in her carport digs. I had to make a shim for the dash support hoop to support the scuttle, in the end. Sigh. I went through half a gallon of filler, with 90% (at least) sanded off. It all looks ok here, in the non-sanded matte primer coat, but I know there are a couple of small wows in the panel (at least). 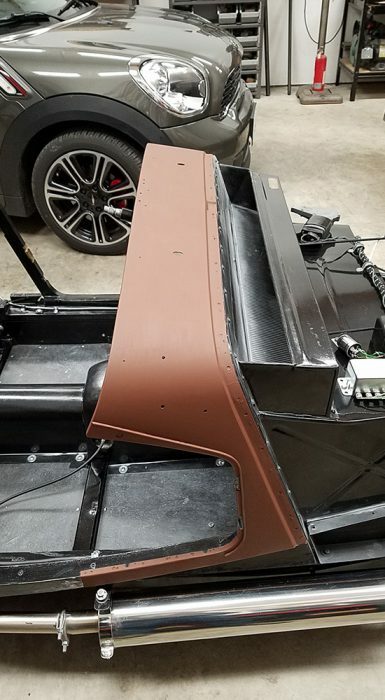 I’ll wet sand this, re-coat, wet-sand again, and then put the dash back in and drive the chassis a bit before starting on the rest of the tub panel work. Starting again, I’d risk a new scuttle panel rather than work with this beat-to-heck one, I think, and use it as THE guide for building the front part of the frame.